Accompenied by a translator I had to go to Wayne State University for 5 times before I got a copy of the insurance policy. 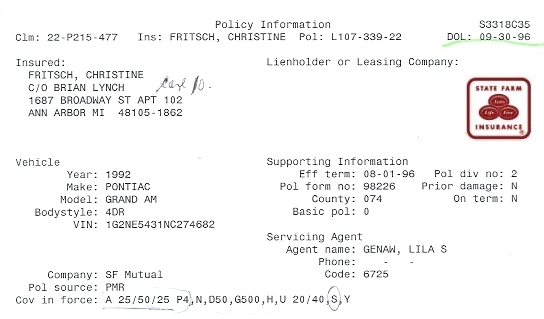 First Mrs. Linda Seatts refused to give me a copy because she told me that insurance documents would be destroyed after 3 years and that they were only accessible by computer. I instantly noticed that the handwriting and the signature did not belong to my daughter and immediately told Mrs. Seatts that it was a falsified insurance. But Mrs. Seatts wanted to make us believe that everyone in the USA is allowed to effect an insurance for my daughter of age without having an authorization by my daughter or notary. 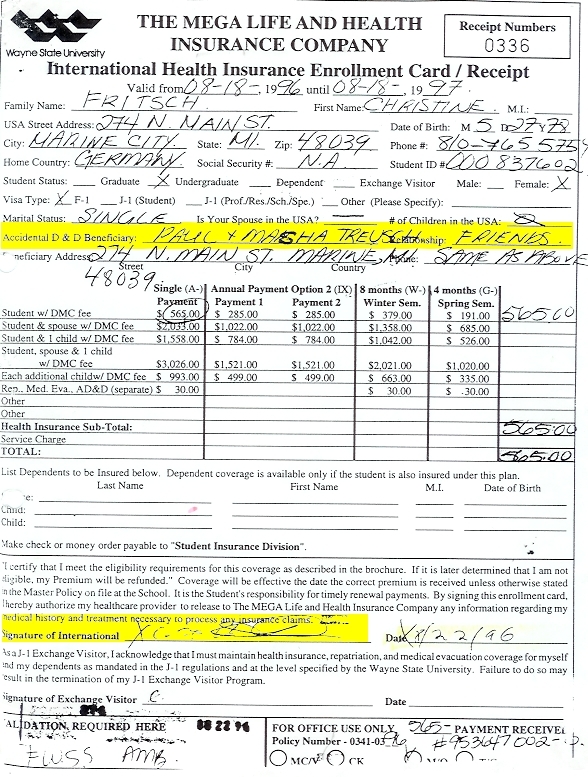 As beneficiary of my daughter’s insurance the family of Dr. Paul and Masha Treusch is registered in the insurance policy. (Dr. Paul and Masha Treusch; 274 North Main St, Marine City, MI 48039, USA, Phone: (810) 765-5754) . As to compare Christine's hand-writing and signature we had got notarized copies of all her documents from the college of Port Huron and her correspondence. The falsification of the handwriting and the signature was proved by a graphological analysis. My American attorney Mr. Bemish told me something about 2 life insurances being effected at Wayne University, Detroit in 1995 and 1996. But I could not get any further information from Mr. Bemish or the insurance company. After my daughter’s accident in 1996 I did not get any documents of my daughter from the Treuschs up to now. They liked to tell me that my daughter had all the documents with her or that they were at the police department or that her former friend Brian Lynch had got them, etc. When I showed the falsification to Mrs. Masha Treusch in August 2001 she did not want to see us or talk to us again. This is the origial signature of Christine! The attorney Bemish has assured me at all times that the American people in the USA (and also my daughter) could effect insurances by word of mouth or by call without signing. Several small amounts were transferred by check to his address from State Farm Insurance with my daughter's policy. Mr. Lynch. But she neither lived with him nor was she engaged or married to him. By fax and mail I have received the second version of the same car insurance with several pages in April 2002. Both versions of the insurance were done by magic out of the computer. The first version of the car insurance had a wrong address of my daughter. 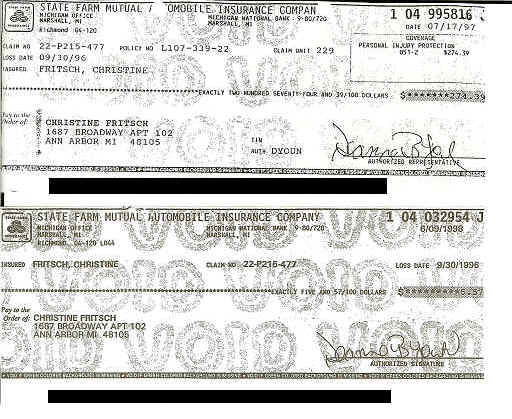 The signature of my daughter is falsified; the address of my daughter is correct; the insurance was effected on Aug. 31st, 1996 with a rubber stamp of Sept. 6th 1996 and contained the Auto number 22-6725-Q46 and the Policy number L107- 339- 22. On other pages of the second version there was a different Auto number: 222 6725 Q46. In Mr. Googasian’s documents I found another car insurance: No. L107- 339- B31- 22. B31- 22. Until today neither I nor my attorney Mr. Andrew L.Bemish have got the original car insurance of my daughter. B. Right after the accident only 3.196,00 $ remained on my daughter’s account at Wayne State University, Detroit where my daughter went to college since 1996. Mrs Stephanie Lawhorn could not tell me where the rest of my daughter's money went. I am still waiting for an answer by letter, as she promised. C. I tried to get copies of my daughter’s documents from Wayne State University, Destroit (Application for Admission, Life insurances from Wayne State and Mega Life, etc. ), but without success. They told me that the documents had allegedly been lost or could not be found according to Mrs. Linda K. Falkiewicz from the University registery. As I wanted to check the hand-writing and the signature I was denied to get these documents (Christine Fritsch, School Code 002329, Ph: (313) 577-7963).